Boston Pedestrian Construction Accident Lawyers :: Pedestrian Construction Accidents :: Massachusetts Pedestrian Accidents. Workers are not the only ones at risk for injury on a construction site. Pedestrians walking by construction activity also face dangerous conditions, such as falling debris, equipment or moving construction vehicles. On a construction site, the property owner, general contractors and sub-contractors have a responsibility to make sure pedestrians can safely cross the street and walk on sidewalks. Pedestrians must be able to travel safely through and around equipment and materials. There must be proper signage and traffic details to assist with pedestrian and motor vehicle traffic. Detours should be set up in cases when safe travel cannot be ensured. Have you been hurt while walking near a construction site? Learn your rights. Call for a free legal consultation: 800-379-1244. In recent years, Boston has seen a building boom. Pedestrians have had to walk around project after project, from the Longfellow Bridge to the TD Garden development to numerous residential condo projects. In Brighton, New Balance erected its new world headquarters, alongside sports practice facilities for the Boston Bruins and Boston Celtics. The MBTA rebuilt Government Center station, rerouting commuters for two years. Colleges have also been building. The University of Massachusetts of Boston expects to open its first residential facility (or dormitory) for students in 2018. Somerville and Cambridge have seen several building projects. Partners Healthcare built new $465 million offices at Assembly Row in Somerville. Meanwhile, in Everett, residents have watched construction of the new Wynn Resorts casino. Pedestrian injuries can result when the property owner, contractor or sub-contractors fails to take the proper safety measures. Pedestrians can be injured in many ways, but often, they are hit by construction vehicles or falling debris. Explosions, fires and entrapments can also lead to serious injuries or loss of life. If the person survives, injuries may include skin burns, carbon monoxide poisoning, head injuries, broken bones and paralysis. They can expect to have a long recovery and should consult a construction accident lawyer immediately. Medical bills can mount quickly and if you can no longer work, you will need to seek lost wages to support yourself or your dependents. But pedestrians do not always survive construction site accidents. One tragedy came in August 2017, when a Dedham woman was hit and killed by a construction vehicle on Broadway Street in Norwood. She had been crossing the street on her way to the train station when she was hit by a construction vehicle being operated by an MBTA employee. Crane collapses have also killed and seriously injured pedestrians. In February 2016, a 38-year-old pedestrian was killed in New York City when a crane operator failed to secure his 565-foot tall crane, causing a serious collapse. The crane was owned by Bay Crane and operated by Galasso Trucking and Rigging. The Occupational Safety and Health Administration (OSHA) later cited Galasso Trucking and Rigging, saying the company did not the lower the boom according to the manufacturer’s requirements. Further, the operator did not make adjustments for weather conditions. 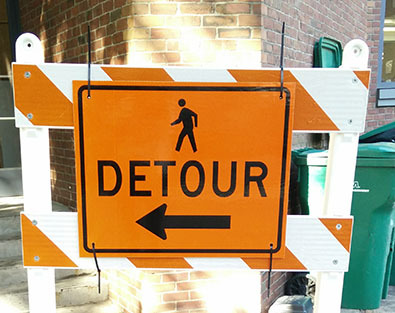 What Should I Do After A Pedestrian Construction Accident? If you or a loved one has been injured in a pedestrian construction accident, seek immediate medical treatment. If you were not transported by an ambulance, have someone drive you to the nearest hospital. Serious injuries, particularly head injuries, do not always show themselves right away. Then you should speak to an experienced Boston construction accident lawyer to determine your rights. An attorney can help you determine if you can file a claim and the amount of compensation you may be able to seek. You may be able to recover damages for injuries, lost wages and pain and suffering. It is best to contact a lawyer as soon as possible so they can launch an immediate investigation to preserve the evidence. It is also best to hire an attorney who specializes in construction cases. Read about our experience representing those injured by construction accidents. As you seek out an attorney, remember Massachusetts has a Statute of Limitations restricting how long you can file a claim. The Boston construction accident lawyers at Breakstone, White & Gluck have over 100 years combined experience handling cases involving personal injury, wrongful death and construction accidents. If you have been injured, contact us today at 800-379-1244 or 617-723-7676 or use our contact form.